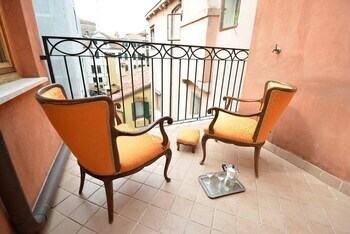 Located in Venice (San Marco), this apartment is within a 10-minute walk of Rialto Bridge and Academy Gallery. With a stay at B&B Mamma Lucia in Sorrento, you'll be within a 15-minute drive of Piazza Tasso and Marina Grande. Self parking (subject to charges) is available onsite. When you stay at Park Hotel Abbadia in Abbadia Lariana, you'll be on a lake, within a 5-minute drive of Civic Museum Setificio Monti and Moto Guzzi. Free self parking is available onsite. With a stay at Poggio Bello in Florence, you'll be within a 10-minute drive of Boboli Gardens and Piazzale Michelangelo. Free self parking is available onsite.